Anna Quindlen recently wrote that "there are moments in history when a leader needs to be much more than a manager. He needs to unite, to inspire and to challenge. There's no better way to do that than by delivering a great speech about great matters." Employed in the service of my country abroad during the whole course of these transactions, I first saw the Constitution of the United States in a foreign country. Irritated by no literary altercation, animated by no public debate, heated by no party animosity, I read it with great satisfaction, as the result of good heads prompted by good hearts, as an experiment better adapted to the genius, character, situation, and relations of this nation and country than any which had ever been proposed or suggested. Every difference of opinion is not a difference of principle. We have called by different names brethren of the same principle. We are all Republicans, we are all Federalists. Much has been given us, and much will rightfully be expected from us. We have duties to others and duties to ourselves; and we can shirk neither. We have become a great nation, forced by the fact of its greatness into relations with other nations of the earth, and we must behave as beseems a people with such responsibilities. 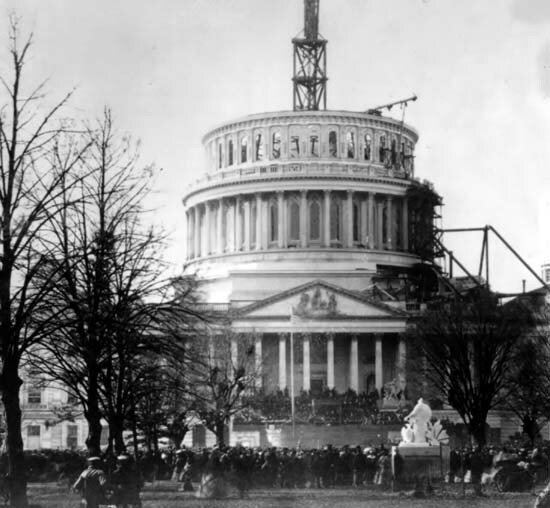 :(photo) the crowd surrounding the east front of the nation's capitol, still under construction, during the first inauguration of president abraham lincoln, March 4, 1861. And I'm guessing Mr. Obama's speech won't be the two + hours that Washington's was. Fabulous, eloquent post, once again. BTW... I linked to you yesterday to share your wonderful post on Dr. King. There were a couple of other posts I highlighted as well. You might be especially interested in Widney Woman's. You are wonderful. I love this post and I love this day. Your banner and 1/20 additions are fab! We haven't had a leader in so long that I think we weren't quite sure what one was. But now that's past... I'm so glad we are fortunate enough to truly be a part of our nation's history today.